Ok, I’ll admit it. I’ve never actually seen Cider House Rules, but I can say that Arsenal Cider House in Lawrenceville really does rule! Though were had visited in its first year of operation, we recently returned with some great friends to find that the selection has grown and so has the popularity.While the Cider House itself only sells the cider by the growler, visitors can sample up to four different variations of cider for free (valid 21+ ID required). There were a couple “still” varietals which resembled an apple wine, but more “carbonated” options which were more beer-esque (think of the 16 oz. Hard Cider you can buy at the beer distributor). TasteBudA was drawn to the apple-fruit fusions of plum and peach, while I found the apple-mead selections to be less complex and enjoyable. The four of us indulged in the sampling before deciding we were enjoying what we were tasting and wanted more. So, we required a growler to continue our afternoon. Growlers, like with beer, are refillable and you can get a punch card to earn frequent-filler-rewards. The decor is completely dedicated to the history of the Lawrenceville Arsenal located right across the street on 39th street. As we sat for a while and chatted, the number of folks who came in to simply refill their growlers was astonishing. Not only did we lose track of time and enjoy and entire growler in-house, but we refilled it and took a fresh growler to go. Like Arsenal Cider House and Wine Cellar on Facebook for information on the local bars and restaurants where they have Arsenal Cider on tap. 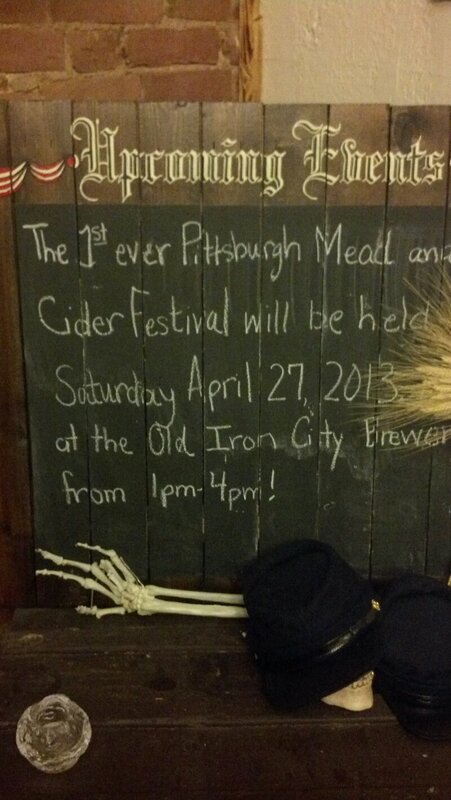 And keep an eye out for the 1st ever Pittsburgh Mead and Cider Fest which will be held Saturday April 27, 2013 at the Old Iron City Brewery from 1 p.m. to 4 p.m.